استرجع كل الملفات المحذوفة / المفقودة من بطاقة الذاكرة أو الكاميرا الرقمية. Aiseesoft Data Recovery is powerful and safe data recovery software. It can help you recover almost all deleted/lost files like photos, documents, emails, audio, videos and more from computer, hard drive, flash drive, memory card, digital camera, etc. It can support all kinds of accidental situation like your crashed computer, hard drive problem, unexpectedly operations or other. 1. Recover lost or deleted data from different situation. 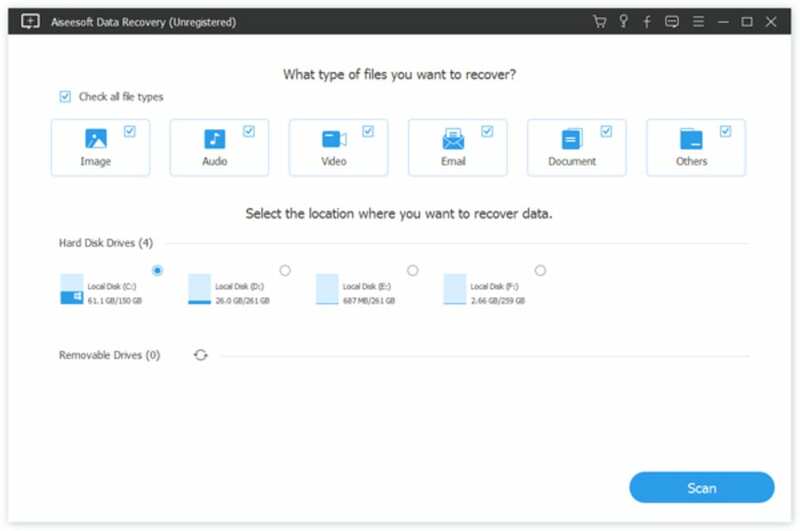 It can help you recover almost all deleted/lost files like photos, documents, emails, audio, videos and more from computer or laptop, hard drive, flash drive, memory card, digital camera, removable Drives etc. This powerful data recovery tool can help you recover any data type like image, document, audio, video, email and more. The type of the data have DOC/DOCX, XLS/XLSX, JPG, TIFF/TIF, PNG, BMP, GIF, PSD, AVI, MOV, MP4, M4V, 3GP, 3G2, WMV, ASF, ZIP, RAR, SIT, and other useful data. No matter your you delete important data by mistake, your computer crashed, data system damaged, and virus attacked, you can recover all lost data back. This data recovery software for iPhone/iPad/iPod allows you to preview deleted image, document, audio, video, email. It also allows you to rotate photos when previewing. it can provide the simple operate and 100% safe, so you can use it conveniently and don't need to worry about other problem according to the operating steps. احصل على iDevice التمهيد مرة أخرى ، بشكل صحيح ، مجانا. What do you think about Aiseesoft Data Recovery? Do you recommend it? Why?